Christmas day in the Queen Charlottes was cold, grey, rainy and eventually snowy and white. But we managed to get our family and three friends out in kayaks and paddle across the water to the Apple Orchard. 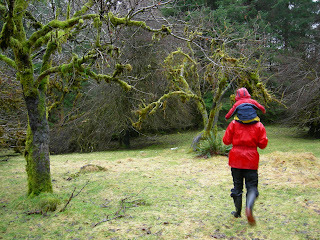 An old abandoned site where big apple trees are heavy with the weight of moss and lichen. It will be sweet to go back on a sunny day in Spring and/orSummer and have a picknick on the mossy grass floor surrounded by these curvy trees. Maybe we can even pick an apple (we did see evidence that they still produce apples!). 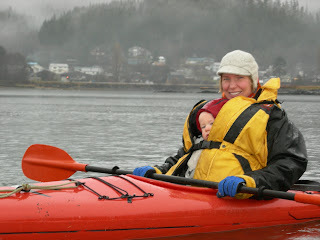 The kayak trip (45 minutes to and 45 minutes back) was just a bit too long for little Lief, he needed some inventive songs to keep him sitting still. Back home he crashed immediately in his crib, while we all gathered around warm soup and toast cheese sandwiches. What a good feeling, after the cold paddle to enjoy the company of friends and good food! 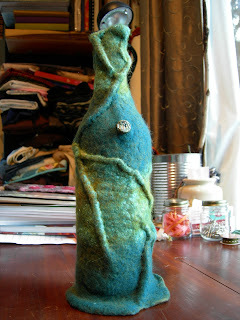 Organic wet felted wine cozy with ceramic button by Brian Eccles. Used some more of Loops' beautiful Mediterranean batts which has Bamboo, Alpaca, Silk and Corriedale and a bit of sparkle incorporated into it. 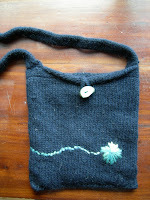 Then I finally finished this knitted bag. I had knitted the body a while ago, but never finished the handle. Then I lined it with Ikat fabric from Maiwa, and decorated it with hand embroidery (that continues on the back) and a nut button. 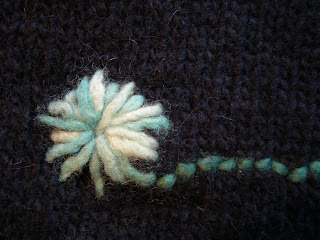 The embroidery is done with a bit of handspun and handdyed yarn that I found at Granville island. 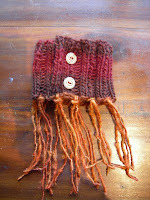 And this is another neckwrap, quite warm and fire-y colours. I think it's similar yarn as I used for the wrap Ella bought at the craft fair. Bone spiral buttons and more handspun yarn from Granville Island. Wishing everyone an inspiring and creative New Year! What an amazing thing to do! You guys are super motivated.